'Burst Of Blue' (Anthony and Dorothy Willott, R. 1998). Seedling #W94-30. MDB, height 5" (13 cm). Early bloom. 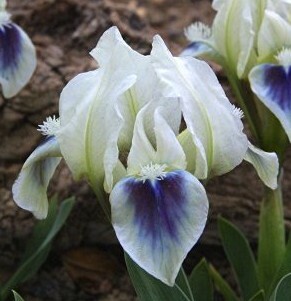 Lightly ruffled white, falls with medium-size full blue spot; beards white. Seedling #W91-85: ('Pittance' x seedling #W79-13: (Greenlee seedling #GX-2 x 'Buttons')) X seedling #W92-6: (Kuban I. pumila #205 x 'Daring Eyes'). A.& D. Willott 1998.